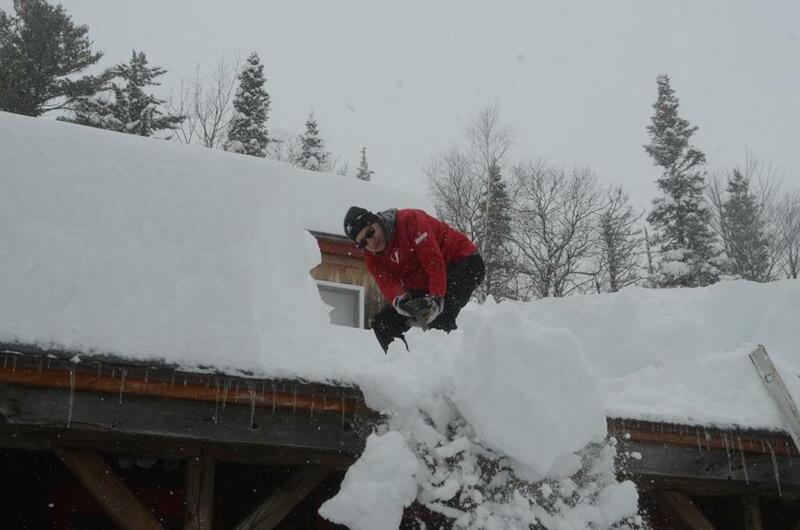 Al Santopietro shoveled snow off the porch roof of a ski rental building at Prospect Mountain ski area. Woodford got whacked, but the community was unfazed. The town of about 420 people in Vermont’s Bennington County was buried under nearly 3 feet of snow Thursday morning, according to the National Weather Service. “Here’s a preliminary map of snowfall based on reports we’ve gotten as of 7a.m. 35 [inches] in Woodford VT is the jackpot so far,” tweeted the weather service’s Burlington, Vt., office. Other parts of the state had snowfall totals ranging from 18 to 25 inches as of 7 a.m., according to the weather service. As of 11 a.m., the snow drifts had gotten a little higher, according to the weather service. “A few spots in far southern Vermont got about 3 feet of snow! 10-20 inches pretty common for southeast Vermont,’’ the forecasters tweeted. Susan Wright, town clerk in Woodford, said in a phone interview that the community is “basically a mountain town” with sections at the bottom of the mountain, in an area called the hollow, and closer to the top. She said the hollow had about 18 inches as of 10 a.m., but the top of the mountain routinely gets twice as much snow. Town Hall was open for business, and no one had called in to report emergencies, Wright said. “It’s been much worse than this,” she said. Wright added that traffic was “moving pretty good on the main road” and credited officials for their readiness to take on the storm. “They were pretty much prepared that this was coming,” she said. Mainers were also getting dumped on. Maine snowfall totals as of late Thursday morning included 19 inches in Sanford, 16 inches in Saco, and 13 inches in Kennebunk in York County; nearly 14 inches in Farmington in Franklin County, 14 inches in Starks in Somerset County; according to the weather service. About 22,500 Central Maine Power customers, most in York County, were without power during the afternoon. And the stormy conditions will persist. “A strong coastal [storm] continues to churn over the Gulf of Maine late this morning, with heavy snowfall arcing along and northwest of its path,” the advisory said.